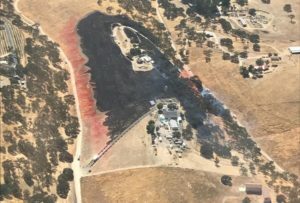 A fire charred a hillside and burned 12.5 acres in rural Paso Robles Sunday afternoon, according to Cal Fire. Shorty after 2:30 p.m., the blaze broke out in the 6000 block of Dresser Ranch Place. The fire threatened two homes in the area before firefighters contained it Sunday evening. Firefighters remained at the scene late in the day to mop up hot spots. 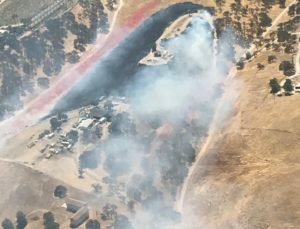 Paso Robles firefighters provided assistance to Cal Fire. In addition to the North County blaze, there was also a car fire on the Cuesta Grade Sunday afternoon. Firefighters extinguished the fire before flames could spread to vegetation beside the road.